Launch a Poll to share your created Polls with the listed users of your desired plan. 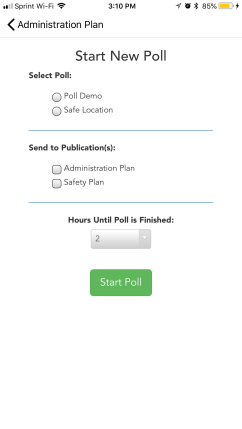 You can launch a Poll from either the Safety Center Administrator Portal or the Safety Center Mobile App if you have added an event to one of your plans for that purpose. Click on the Collaboration tab and select Start Poll from Template. Under Select Poll, click the Radio Button next to the Poll you want to launch. Under Send to Publication(s), select the Plan(s) you want this Poll to display for. 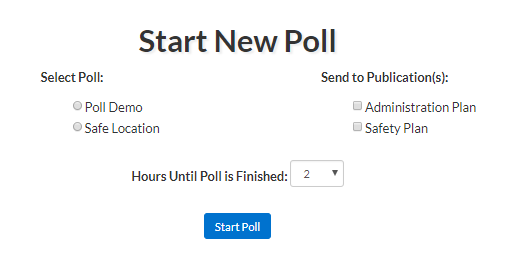 Select the number of hours for the Poll to be live from the Hours Until Poll is Finished drop down menu. Click Start Poll. The Poll is now available for users to respond to for the duration. Before Launching a Poll from the Mobile App, you will need to have added the Launch a Poll event to your plan. Open your plan and select the event for launching a Poll.